Time and distance mean everything in baseball. One second wasted and an inch off the mark could make the difference between you and your competitor. 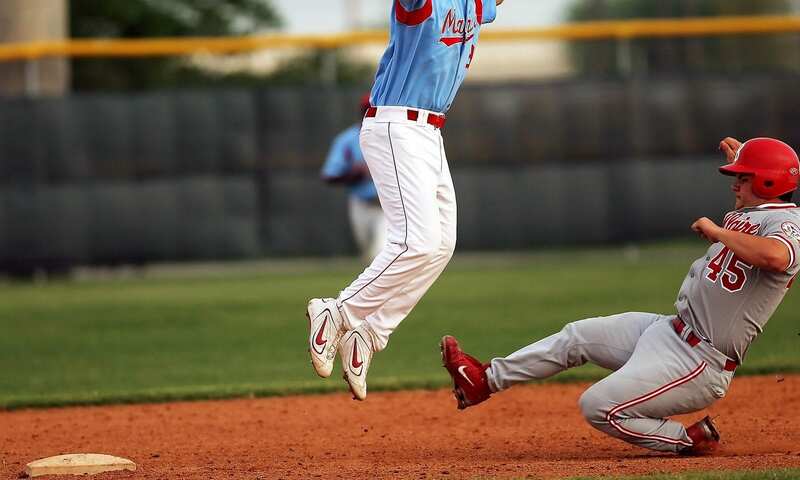 Having reliable baseball cleats will put you in the game. The best baseball cleats will also give you maximum comfort, and stability while running or braking. 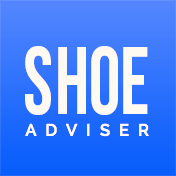 Technology has played a vital role in ensuring athletes acquire shoes that are excellent in outlook as well as functioning. Unlike other types of shoes, baseball shoes have sturdy spikes and shape streamlined to fit the game. View the Best Cleats for Baseball, Below. What Do Baseball Cleats Look Like? How to Clean Baseball Cleats? How to break in Baseball Cleats? You will not play the game with your casual rubbers or indoor soccer boots. Because of the intensity of the game (though non-contact), you need a shoe that keeps you grounded even when sprinting. Because of the love for the game and concern about your performance, this article and buying guide will give you an assessment of some of the top rated baseball cleats in the market and their features. Just like many other sports, baseball is a game of inches. It starts from a pitcher painting a corner and then a runner beating out a tag. The difference in the inches is what is used to determine the loser and the winner of the game. The stakes are high for the game, and this is the reason each player should look for the slightest things that could make the difference. One of the aspects that make a huge difference is the cleat worn. Baseball cleats will help the player improve their traction and stability on the field. There are a lot of advancements made in cleat manufacturing to make them more durable and offer more support to players. The manufacturers are also factoring position specificity for maximum efficiency of each player. Therefore, there are different cleats for the different positions in baseball. Hence, it is crucial to know the difference between the various types of cleats when purchasing a new pair. There are multiple factors to consider when you are buying your baseball cleats. Let’s have a look at them. Baseball cleats are made of different materials. There are those which are made of genuine leather while others are made of synthetic leather or textile. Genuine leather is more supple, breathable, and durable compared to synthetic leather and other fibers. The genuine leather cleats come at a higher price than synthetic leather understandably because the quality of the material is high. On the other hand, synthetic leather gives the player extra support at the middle and the front of the foot and the ankle. Synthetic leather boots come at a more affordable price than the genuine leather cleats. As you make an affordable purchase, it is crucial to give your comfort a priority because it determines your performance in the game. When looking for baseball cleats, you will realize that they come in three primary categories. They include metal molded baseball cleats, turf or fitness shoes and molded plastic cleats. Here is an up-close look at each type of the shoe. The metal baseball cleats provide the best traction when compared to all the spike types. This is because they can dig in the dirt on the fields and also on the grass. They have a better grip that is essential when taking off. When slowing down the cleats will keep you planted. Metal baseball cleats are great when the baseball batter wants to dig a toehold in the baseball batters’ box to hit the ball without slipping. They have a firm grip such that they have been known to cause injury to players who have suddenly changed direction while playing baseball. It is also necessary to note that metal spikes quickly wear off when worn on other surfaces other than grass or dirt. Some leagues prohibit this type of cleats. Therefore, consider familiarizing with the rules of the game before making a purchase. Rubber or plastic characterizes these cleats. The materials are fixed on the outer sole. They are sturdy and stable. You can wear them on most playing surfaces. They can be worn in concrete and asphalt salts without wearing which gives them an advantage over metal baseball cleats. The plastic cleats are cheaper when compared to metal baseball cleats. They are also known to be more durable. However, they do not offer the same grip as the metal baseball cleats. They cleats are preferred by players when playing on soft fields or muddy conditions. They bounce off the ground when it is muddy rather than getting stuck in the mud. These are the types of shoes which baseball players wear when practicing or training. These shoes are comfortable as compared to the cleats. They do not tear the training facility. Turfs should be worn on artificial turf surfaces so that they can have the required grip when training. The turf surface will ensure you have the right grip with the same effect as the cleats mentioned above. The turf shoes keep the players’ feet close to the ground while providing the required traction and minimum injury. It is important to note that while training you should not wear plastic spikes of artificial turf. You will not get the necessary grip to stand on the turf. This might lead to injury. These are multiple materials in one cleat. They are a combination of metal and mold. They offer players a chance to have just one pair of cleats if they are playing in different leagues. These cleats are attached to the shoe with screws and can be easily removed with a tool that has been provided. The only disadvantage with these cleats is that they are heavier than the other types because of the changing hardware. The style of baseball boots can be broken down into three main categories based on the ankle support they provide. They include the high top baseball cleats, mid baseball cleats, and low baseball cleat footwear options. The high tops are extended up the ankle and offer more support to the feet especially when the player is moving laterally. High tops are known to restrict the movement of the player but are essential in keeping the ankle in the best condition thus avoiding injury. If you are looking for speed and not stability, then the low tops are the cleats to go for. They allow quick lateral movements, and the minimalistic style in their construction will help you splint across the field quickly and also across the base path with utmost speed. The mid baseball cleats are the last category of style. These are ideal for players who are looking for comfortable movements while having moderate ankle reinforcement. The position you play dictates the kind of baseball cleat you are supposed to be wearing. If you happen to be a base stealer, then a flexible cleat will allow you to move from base to base. If you are a defensive player, you need a shoe that will help you move in any direction with ease. Depending on the position you play, here are suggestions on which type of baseball cleat you should wear. When an infielder is choosing whether to buy a metal or plastic cleat, they should consider the maintenance of the field that they play on. If the ground is compact or dense, they should go for metal cleats. This is because metal cleats will be more comfortable to move in on the gravel as compared to the plastic soles. It is recommended that you wear metal cleats because they are will not pick up the large patches of grass the way the molded baseball cleats could. 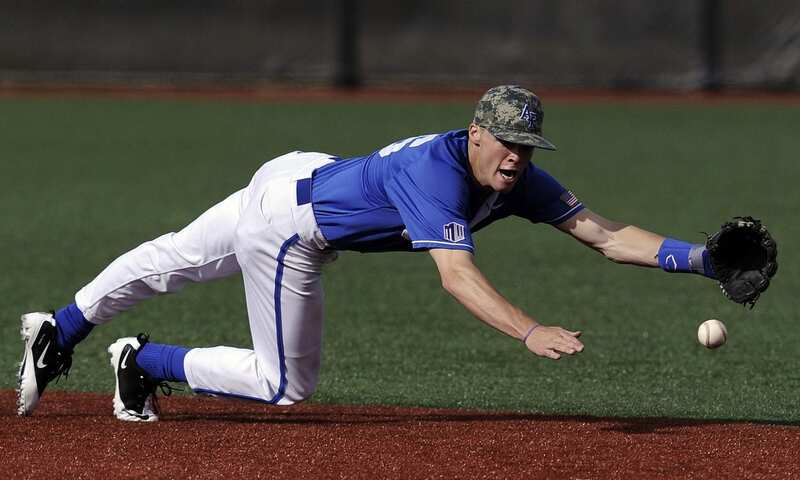 Outfielders plant their toe hard and deep into the turf when they are trying to chase the balls. The metal clips will dig in and out of the grass easily than the molded baseball cleats. Pitchers throw better balls when they have push-off feet. They use the foot for power and support. Therefore, they need a cleat that offers stability. When the pitcher is playing in a densely packed ground, they need a metal studded cleat to increase stability. Pitchers are also advised to wear the low top designs. Baseball is a loved sport all over America, and most people use it as a pastime. The major baseball league in America took place in the 1800s. Cleats are quite essential in having an excellent performance when playing. Therefore, which are the best cleats on the market currently? Let’s have a look at the top 10 baseball cleats for exemplary performance. The New Balance 300v3 is said to be the most comfortable and well-designed cleat t in the market. The New Balance 300v3 is a durable cleat that has REVlite cushioning that aids in keeping you more comfortable through the extra innings. It also has the customer midsole or the insert that is meant to give more cushioning to the heel. 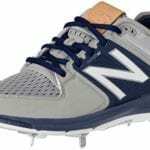 The collar design of these new balance baseball cleats is also intended to provide the player with more support and comfort when sprinting or when they are standing still. The New Balance 300v3 is constructed with synthetic fiber on the upper part. The New Balance baseball cleats are made with a dual density midsole that is full-length Revlite. They are meant to have the laser-etched, highly polished plate. Also, they have a toe protector. The cleats come with a synthetic unbuckle or upper mesh. 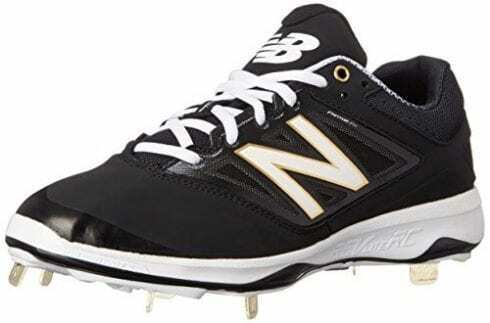 The New Balance 300v3 is constructed with metal spikes which makes them ideal for pitchers in the game. They have eight metal spikes on the outsole plate. 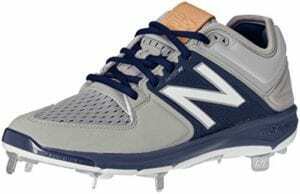 These New Balance Men's metal baseball cleats are easy to use on natural turf and also soft ground because of the traction and support that they offer. The spikes are constructed to be light enough to provide maximum comfort to the baseball player. The New Balance 300v3 is a mid-top for the collar. The New Balance baseball cleats offer support to the ankle when sprinting and also provide much-needed support and stability for the player during the game. These New Balance men's metal baseball cleats are ideal for players who do not run as much in the game. The New Balance Men's metal baseball cleats are suitable for players who are looking for stability and support too. The Nike JORDAN XII RETRO Baseball Cleats are inspired by the iconic Air Jordan XII shoe. The Nike Men's Jordan's are a great option for pitchers mainly for giving great traction and speed thanks to having a Pebax nine-cleat plate. 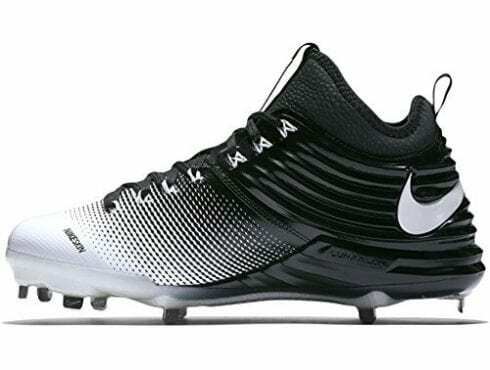 These Nike baseball cleats also have Heel Air-Sole unit which offers lightweight impact cushioning so keeps your feet protected. 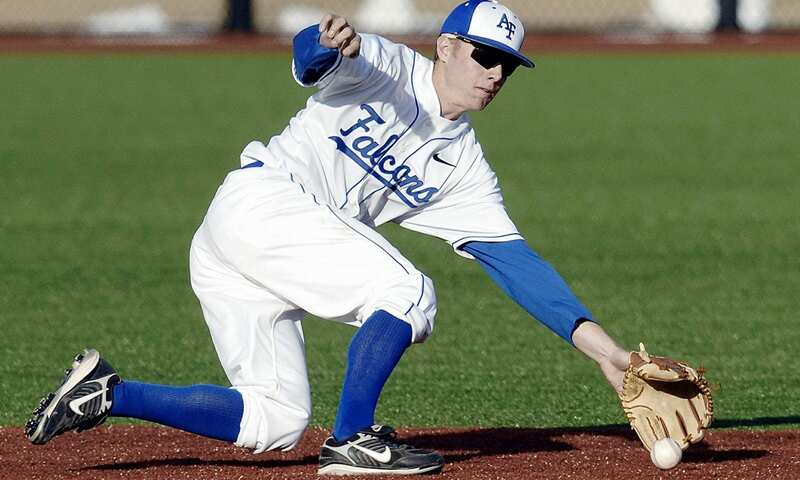 These Nike baseball cleats are made of Synthetic Leather material. Its Phylon foam midsole makes it lightweight and offers maximum cushioning. The Nike JORDAN XII RETRO Baseball Cleats have Pebax metal cleats which mean they provide the much-needed traction and stability while playing. The metal spikes offer excellent support and stability for the players. 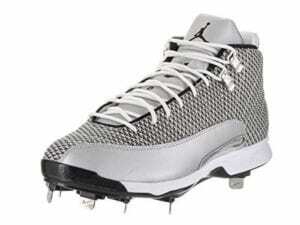 The Nike JORDAN XII RETRO Baseball Cleats are constructed to facilitate excellent ankle support with a high top. This makes these Nike baseball cleats ideal for a player who is looking for more stability than speed while playing. It restricts the movement of the foot but also protects the ankle from injury. The Nike JORDAN XII RETRO Baseball cleats also come in different colors. The Mizuno 9-Spike Franchise 8 is engineered to have ultra-responsive traction, stability, and comfort. The Mizuno 9-Spike ADV Franchise 8 is lightweight and is designed with a premium suede upper cover for the best feel and performance. 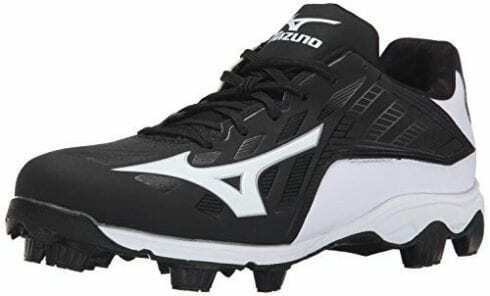 These Mizuno baseball cleats have a parallel outsole that provides excellent cushioning for the player. It is also fitted with a padded tongue for exceptional comfort. Mizuno is a trusted brand that has been on the market since 1906, and they have not disappointed in their current cleats. The company has taken particular pride in participating in the world of sports. They have been part of numerous worldwide events. They aim to create sportswear that is ideal for all climatic conditions. Whether it’s too hot, they will ensure that the player is relaxed and comfortable and if it is cold, they will ensure that the players are warm enough. This will keep the players comfortable while playing and also make sure that their performance is not affected by the weather. This will ensure that they will take their game and perform to their level best. The Mizuno baseball cleats are made with suede which is a synthetic fabric on the upper side that gives it a great look. The materials of the cleat make it more comfortable and also always warm. The spike type for the Mizuno 9-Spike Franchise 8 is metal. The 9-spike franchise cleat is super light which makes it great for running rather than pitching because of the positioning of the nine spikes. The Mizuno 9-Spike ADV Franchise 8 is made with a mid-top ankle which gives space for maximum manipulation of the ankle, and this is why thses Mizuno baseball cleats are ideal for running. The running shoe has a Proflex feature that allows the forefoot to navigate through the different flex zones. The New Balance 4040V3 cleat is primarily designed to fit the player perfectly. It is a laced-up cleat that has exceptional branding details while also having a tremendous protective toe overlay and a padded color. It is lightweight and offers the much-needed support to the player. It also comes in a variety of colors. The New Balance 4040V3 is made of a synthetic material on the top and outer sole. It is also fitted with the full-length of Revlite lightweight foam on the midsole. The New Balance 4040V3 is made with metal spikes which make it ideal to play with on grass because they offer high stability. The collar of the cleat is mid-top of the ankle and therefore offers maximum support. It is made with the no-sew phantom fit on the upper part, and this makes it lightweight and also adds to the support factor. The Nike Lunar Trout 2 is a top ankled cleat that is made with mesh. It is made with a dynamic technology that provides the high stability and strength for the player. It is fitted with a Pebax speed place that gives excellent stability and ultra-responsiveness. The Nike Lunar Trout 2 is made of mesh material. The shoe is made to D wide. The spike type of the Nike Lunar Trout 2 is metal. They are ideal for high school players who are not playing on turf. The collar of the shoe is on top of the ankle. It is also fitted with nine metal spikes to improve traction. It also has Lunarlon foam which is placed at the midsole. That material is soft and responsive. It is quite durable because of the material used to make it. The Under Armour Men's Harper 2 RM Cleats come with a top of the ankle collar which makes it ideal for players who need their ankles protected when playing. The Under Armour baseball cleats offer excellent stability, but are not suitable for running on the pitch. It has a full-length midsole that absorbs pressure and also distributes it to prevent fatigue. The material offers maximum comfort and gives your feet a soothing effect. These Under Armour baseball cleats are made of synthetic materials on the upper side, and the material offers much-needed support, and the cleat also offers excellent support. The spikes of the Under Armour Men's Harper 2 RM Cleats are rubber. Meaning that they are ideal for playing in all types of fields and they also provide considerable traction. The Under Armour baseball cleats are designed with an adjustable ankle strap that locks the leg and offers sturdy support and stability. The Under Armour baseball cleats also have a full-length EVA midsole that helps in dispersing the pressure on the cleat for much-needed comfort and great cushioning from shock exerted while running or decelerating. The Mizuno Dominant IC Softball Cleats are crafted with comfort as the key feature. It is a soft and flexible cleat that has superior cushioning. It is said to be the most comfortable cleat that has been designed having the most natural fitting and comfort in baseball. It is made to have an anatomical shape that fits the player's foot perfectly. 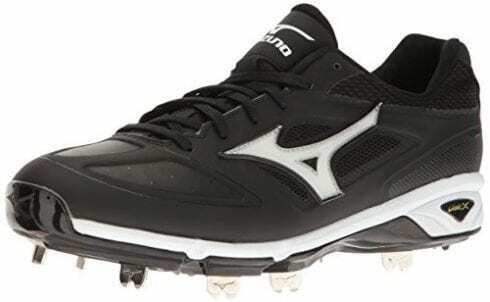 The Mizuno Dominant IC Softball Cleats is made of textile and synthetic materials. It has a synthetic sole. It has an outsole that gives enhanced flexibility as well as traction. The shoe is constructed to provide a soft and secure fit. This is attributed to the supportive 3-layer that offer the perfect fit for the feet. It has metal spikes. This aspect makes the Dominant IC Mizuno Softball Cleats give the much-needed traction, especially when playing in a muddy field with grass. The Mizuno Dominant IC Softball Cleats is made with a superior fitting that is meant to minimize power loss and also help in improving acceleration for the player. It is fitted with the U4icX that is a Mizuno soft material which is a resilient mid-sole material as well as a responsive one. This makes the shoe to have a very luxurious cushioning. It also has the new IC outsole that provides flexibility and traction because of the strategic positioning and configuration of the spikes. Provides excellent traction and stability. Feels great on the feet. Adidas is known to make great sportswear. They are keen to know what the players need when they are in the field. This is part of the reason that the adidas Originals Freak X Carbon Baseball Cleats stand out. They are incredibly comfortable and offer great support while playing. These cleats are lightweight and also breathable. It is constructed with an air mesh on the upper side that comes with reinforced durable overlays. It also has a molded heel that is supposed to offer more support on the ground. 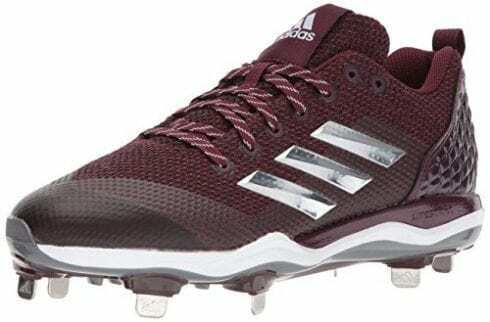 The Power Alley 5 Adidas Baseball Cleats is made of synthetic fiber which is breathable. Therefore, there will be no rise in temperature of the player, especially when won for a very long time. The adidas Originals Freak X Carbon Baseball Cleats have plastic rubber spikes which make them ideal for playing in any field. These features are suitable for playing in the turf. They also offer stability for the player especially when playing on concrete. The adidas Originals Freak X Carbon Baseball Cleats are made with the LITESTRIKE EVA midsole. The material is lighter than the standard midsoles. It also has a molded heel and a heel clip that adds the support of the shoe to the player. The PowerAlley 5 Adidas Baseball Cleats also have a seamless toe cap that gives superior abrasion resistance in the toe-dragging area. Check out the Adidas Poweralley for an alternative. The NIKE Vapor Elite Baseball Cleats are good looking and comfortable. The low baseball cleat has a low-cut synthetic leather upper that gives you a lightweight shoe. The cleats have breathable upper that allows ventilation. The low baseball cleats come in a wide range of colors to choose from. The NIKE Vapor Elite cleats are ideal for speed because they keep you grounded without weighing you down. The NIKE Vapor Elite Baseball Cleats is made of a synthetic material that is lightweight and also very breathable. It is also made with a mesh collar that also adds to the breathability of the shoe and also offers optimum comfort. The low baseball cleat is made of rubber spikes that are ideal to play on different types fields. They offer the much-needed traction and support when playing in the different types of tracks. The NIKE Vapor Baseball Cleats are low cut with the synthetic material on the upper part of the shoes. The toe box is made with perforations to enhance the breathability of the boots. It also has a lightweight sock liner that helps in cushioning the foot and keeping the player comfortable. It is also made with the TPU cleat technology that enhances the durability of the footwear. The Adidas Adizero Cleats is designed for game changers. From its looks to the materials that have been used. It is made of bold colors, and is also lightweight. All the cleats in this line are multi-colored. The outer sole is made of durable rubber that assures you of long-term service with proper care and maintenance. The running shoe is made of synthetic material of the outer and the inner sole too. The running shoe or adidas baseball cleat is made of rubber pikes. 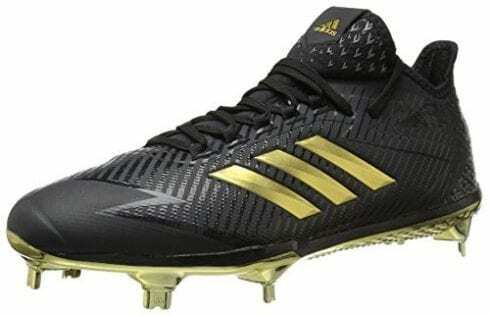 This means that the Adidas Adizero Cleats are ideal to play in any field due to the traction offered by the shoes. The Adidas Adizero Cleats have a low cut collar meaning it is a low cut ankle. Therefore, it is ideal for running. They are also multi-colored. They are covered with the sprint skin on the upper part which gives them the multi-colored graphics. Baseball cleats are designed almost the same as the soccer cleats, but they are modified to give athletes more traction and support. They are also intended to provide comfort to the players when they perform on the diamond. They have an inbuilt technology on the outsole of the cleats that are generally either metal or molded plastic. A metal outsole is popular, and it gives more traction as compared to the molded baseball cleats. Baseball cleats have a toe cleat that is used to dig into the dirt. The toe cleat also helps in acceleration. The shoes are not made for contact or for stepping on players. Playing baseball means that your cleats are will get muddy from the grass and the turf from running all over the diamond. If you are baseball player, you know how it feels to have your clean cleats get dirty and messy. But you need not worry; we have an easy way to clean your shoes. We will look at each step to keep the glow of your baseball shoes. You can also try a shoe deodorizer. You can do this by clapping you cleats together so that you can shake off the mud and the dirt. You need to be careful when you are hitting the cleats together not to get dirt on your clothes or the furniture around you. After that, you need to pick up the pieces of mud and put them in the trash. Also clap the cleats together so that you can clear the sand from the inside of the shoe. Make sure that you use warm water and not hot water to avoid damaging the leather or the plastic parts of the shoe. You should immerse the cleats in the water for about 5 to 7 minutes. Make sure that you pay attention to the time so that you do not keep your cleats in water for too long to fade. Keep them for an extended period might damage the fabric of the shoe. After the dirt has been softened, you need a brush to scrub off the dirt off the cleats. After that, you should dunk the cleats in warm water. After putting them in the warm water, you need to use mild dishwashing soap to clean the cleats. This process makes sure that the stubborn dirt that might be on the cleat loosens. You can decide to use a piece of cloth to clean the cleats, especially on the corners that the brush is not able to reach. After that, rinse the cleats with clean water. Before air drying your cleats, make sure that all the dirt has come off including the sand that is usually on the inner soles. When you have just bought your new pair of baseball cleats, the first thing you should do is break them in. Make sure that you never play in new cleats without breaking them in first. If you do, you will experience a lot of pain when playing. This will disadvantage you. It is hard for you to play and put your best foot forward. To break in your cleats, you will need three things. You require two pairs of socks, a leather protector, and a newspaper. Then you need to put on the two pairs of socks. The two pairs of socks give you an extra cushion. They also ensure that the leather is stretched. After that, you need to bend the cleats bottoms down. This flexes the shoe just a little bit. Then, apply the leather protector following the required direction on the manual. After that, put the boots on and soak them in warm water. The warm water speeds up the breaking process. After a while, step out of the water and remove the cleats and leave them to dry naturally. Make sure that you do not apply any heat to speed up the process. This will help the cleats to keep their shape when drying. Whether you are an amateur or an expert in the game, you need shoes that will serve you. The cleats and upper part should be made of a durable material without compromise to your grip. Your positions should also guide you to know the top rated baseball cleats to buy for excellent performance. That one-inch skid could make a difference between you and your competitors. Your cleats should be a companion in your game offering comfort, stability, and support as you play. However, depending on your position in the game, each factor is needed in different measures. Pitchers need a shoe that will offer the maximum support while outfielders need grip. The infielders should consider maintenance of the field they are playing on when buying their cleats. You should outdo your competitors right from the start by wearing the right attire for the game. You will have an easy time if you have recommended gear. You will avoid probable injury too. The metal cleats are only allowed in college softball and high school baseball. This is a rule that was made by the NFHS in 2008 that allowed high school students to wear metal cleats while playing. However, in the states of New Jersey, Maryland, and Massachusetts the ban on metal cleats on the softball field is still in place. The ASA has also refused to adopt the rule. Did you know that nearly all the youth baseball leagues prohibit the use of metal cleats in the field? It is best to check your league’s regulations so that you can find out which cleats are legal for you to play in. The first reference of baseball was made in 1744. The mention was in a religious setup by a bishop who was against the playing of the game on Sundays. However, there are other reports that the game was referred to as “stoolball” in earlier years. Struggling to decide whether you need high or low top baseball cleats? Find out in this study. We hope you enjoyed our article on "The 10 Best Baseball Cleats", if so, please share and rate it.